On 24 July 2013, Anglican priest Rod Bower put up these words on the roadside sign of his Gosford parish church. Next he posted them on Facebook, sparking a social media revolution. The post was shared thousands of times – suddenly the one-time butcher was on the public stage. Today Fr Rod has close to 65,000 followers on social media. He uses this platform to raise questions about Australia’s corporate soul, to assert that we are all brothers and sisters – asylum seekers, Muslims, those identifying as LGBTI, Indigenous Australians … And for such messages, the death threats pour in. How did a shy adopted kid from the country become this steadfast conscience of our nation, preaching both peace and disruption? 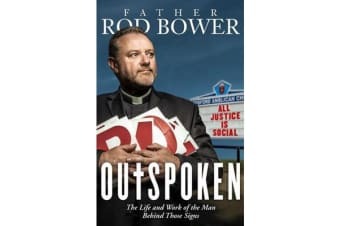 Part life story, part love story, part manifesto, Outspoken describes an evolution as surprising as are Fr Rod’s views about Christianity. Utterly frank, both philosophical and funny, this is a singular book by a singular person. It illuminates the life and work of the man behind those signs.